Research introduced to Europe and America concerning this theme is scarce. For this reason, the first half of this text explains basic knowledge as a foundation. In the latter half, my research will represent an example of methods used in Japan. In addition, there are no "graphologists" in Japan, so this paper may not be directly useful for the Western graphologist. However, I believe that this text will serve as a basis of understanding research methods in Japanese handwriting. First of all, the research of handwriting can be compared between Japan and Europe. However different, it can be agreed that there is an excellent place in each. Before explaining the research regarding the handwriting of children in Japan, I would like to clarify certain characteristics. According to Kuroda *1, there are many traditions of graphology that exist in Europe. These include relation, graphology, psychology, and the handwritten technique and style of characters. Influenced by Europe, the following fields are now researched in Japan: * Scientific graphology * Scientific handwriting research with regard to the relationship between characters * Motor theory of handwriting research * Relationship between handwritten letters and pathology On the other hand, there are other fields of research that originated in the East. This is largely due to the fact that there are two character systems in Japan called Kanji (Chinese characters) and Kana (Japanese characters). Another factor in the development of research in handwriting is because the cultural art of handwriting exists in Japan. 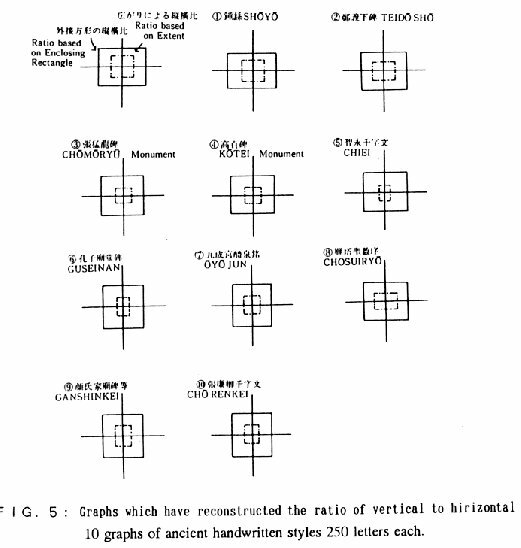 Kana is a phonographic system that is comprised of 48 letters as its basis. In Kana, there are both Hiragana and Katakana alphabets. If there two letters systems are added, there are only 96 letters. However, the other Kanji (Chinese characters) are said to contain over 40,000 letters alone. As a Japanese standard, elementary school children read and write approximately 1,006 Kanji characters, while junior high school students are expected to read 1,945. It is clearly a unique aspect of Japan that it is necessary to study such a large amount of characters for literacy. Moreover, the structure of one Kanji character is often times very complex. Many of these difficult characters which children learn in the elementary level contain over twenty strokes or more. Therefore, complicated Kanji often become a large burden for young children, and in this respect, is a peculiarity of Japanese handwriting education. Next, Shodo (the art of writing calligraphy) plays a deeply inherent role in the Japanese mind. Dating back to 4th Century China, many books were written regarding the importance of artistic elements in handwritten letters. This influence was strongly felt in Japan. Historically, in the same way that the Europeans used the pen, the Chinese and Japanese employed the Fude (brush pen). Not only have they been concerned with practicality, but they have especially noted the beauty of the letters they write with the fude. This consciousness has survived time, although the opportunity to use the fude in a modern practical sense, is almost non-existent. From the third year of elementary school Japanese children practice handwriting with the fude. However, it is largely believed that people with excellent handwriting are those who are prominent in society. This thought is seen in Chinese books from around the 11th Century. When examined, this idea seems similar to European graphology. Although, it is also necessary to consider the content meaning as well as the written character style. In Japan, it is necessary to further examine the personality and style of the actual written word to conclude that the work is excellent. Moreover, the thought has spread in Japan that practicing handwriting improves personal character. Because of its unique features, the research of written letters in Japan has characteristics that are absent in the West. One characteristic is the complexity of the letter system and letter formation. 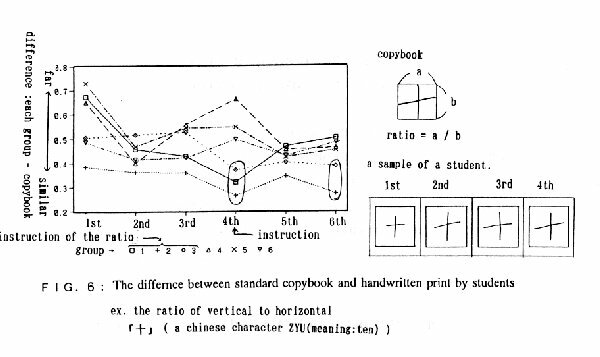 Most Japanese researchers were not concerned with the standard form of handwriting, but were mostly interested in the problems of abstract character systems. Japanese research has mainly focused on the content of each written letter instead of the form and shape. Furthermore, the main problem in the field of handwriting education has been the methods of successfully teaching the great amount of Chinese characters. Therefore, research concerning a standard handwriting system has not easily advanced. Finally, research concerning the teaching of characters in schools is done in an even smaller field under Chinese Character Education. Some research is done in the psychology field, but those who target handwriting are very few. There is some research also conducted by the police; however, this research is highly influenced by the West. For these reasons, the field of handwriting study and consideration is very small. Research in Japan is conducted in the special field of Shogaku-shyodoushi Shodou-kyouiku (Education and History of Handwriting). In this field, researchers mainly study calligraphy as an art. If they are not studying artistic works, then their studies are often archeological. However, the field of Shosya-syodou-kyouiku includes the education of handwriting and calligraphy. In this field researchers study history, comparison, and practice. Their purpose of research is to target theories of content, education, evaluation, and children. In this field, the actual conditions of modern handwriting is also researched as a foundation. I have conducted my research under this field. As a researcher of data processing, I have studied handwritten letters by computer diffusion, a method of handwriting research that is steadily gaining popularity. Computer diffusion researchers use a computer to recognize handwritten characters in order to conduct their research. With advances in technology, growth in this field of research is expected. By the use using "Cognitive Science," fences surrounding research are removed and new directions opened. Because researchers are few and research topics broad, joint research has been necessary for the field to advance. This manuscript is the fruit of current joint research of Shosya-syodou-kyouiku (Education of handwriting and calligraphy). The Japanese writing system is unique, and the range of research does not always correspond directly with Western research. However, common area exists. For instance, different writing styles (syotai) are practiced in Japan, just as there are different styles in the West. There are approximately five different Chinese character styles. Presently, two are used in Japan. One is Kaisho, which is very similar to printwriting; the other is Gyosho, a cursive style of manuscript. Japanese children learn Kaisho as soon as they enter elementary school. In junior high school, students study Gyosho. Because junior high school students are busy studying for Japanese college entrance examinations, they cannot sufficiently learn Gyosho. Is such a case absent in the West? Next, the Western style typewriter did not exist in Japan because of complications from Chinese kanji characters. Only twenty years ago a Japanese word processor was developed. Thus, the opportunity for handwritten letters has decreased. Handwritten private letters are somewhat of a Western custom. In Japan private letters are usually printed by word processor. Moreover, the medium of new information such as e-mail and internet must not be overlooked. The theme of increase and decrease in handwritten opportunities has a great influence in Japan. Gyosho is the easiest method of writing Japanese; consequently, it is not fully taught to school children. What and through what method is best to teach school children? This is what can be learned from the West. There is a theme common to both Japan and the West regarding research. In both, handwriting researchers can be criticized because they rely on perception and experience. Intuition and experience is not structured enough to produce concrete research. However, it is preferable to use an objective which is possible through scientific results and study. Scientific research is a problem not only in Japan and in the West, but throughout the field of graphology and handwriting education. Perhaps it is necessary for researchers to itemize and document specific analysis in order to create a solid basis which can be used as reference. Furthermore, computer application, image scanning, and digitizing are necessary for statistical data of handwriting research to be fully objectified. The main aim for handwriting is to write neat, beautiful characters that can be easily read. Therefore it is necessary to study both operation and form for research. First, there are three examples that concern form in relation to research. It is necessary to analyze the movement made when writing individual characters. Then, a second aspect is the actual static form itself must be considered. The present situation and trends in children's handwriting in relation to model characters can be outlined in three points. To be admitted into elementary school children learn hiragana. In this early period their aim of study is to construct characters similar to standard models. 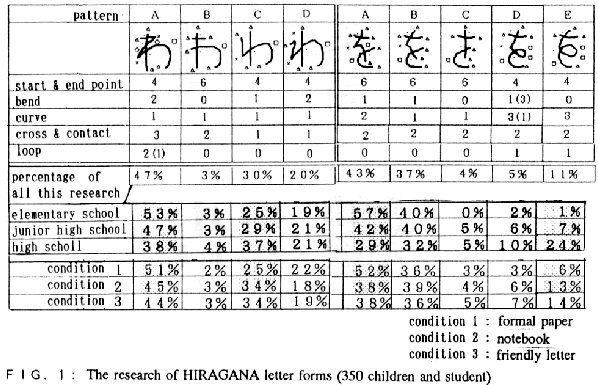 The forms of hiragana written by elementary, junior, and senior high school students were examined. This investigation resulted in a clear pattern, outlined in Figure 1. The letters used are hiragana characters <��> (wo), and <��> (wa). Figure 1 examines the differences in letter form between girls and boys throughout time. In these patterns, the degree of complexity defined by Kabashima *2 was calculated. See Figure 2. Letter (A) serves as a standard print of each character. In (A), the degree of complexity is very high. Looking at Figure 2, it is obvious that the complexity decreases as children advance from the elementary school to high school, while the degree of simplicity increases through time. Such simplification, the shift from vertical to lateral writing, and change in letter element was studied in this survey and can be used as a basis of research. For example, one can study the validity of the standard letter model, as well as changes of letter form by age. Furthermore, in order to understand the personalities of the individual children, it is necessary to see this progression. Figure 4 (beta) is an example of emulated Chinese script from the 7th Century. To verify this scientifically, Figure 5 is presented. Figure 5 shows the relation of a character's inside and outside frame. It is very easy to write a very neat, balanced character in such a way that the lengths of the horizontal and vertical will be equal. Moreover, it does not damage the decorative beauty of the character to alter one stroke accordingly. To reach such conclusions, in terms of education and research, it is very useful to examine the styles of letters which children study. Again, research illustrating the change in children's handwriting throughout the duration of study in school is presented. High school students were the objects of this experiment. The study analyzed how students' letter forms changed when later presented with a model standard. The students were divided into six different groups and made to write the letter (ten) �u�\�v several times. Consequently, each group differed in quality. In the first try, all groups were able to view the printed standard and then write it. In the second try, they were shown the handwritten standard. The point of variation occurred in the third trial. Groups 1-3 were instructed to note the size of the character in the third trial. Next, the instruction to note the ratio of vertical and horizontal length of the letters was given in the fourth trial. In the fifth trial, the students were instructed to note the intersection. Finally, the same instructions were repeated in the sixth trial. The horizontal and vertical ratio was shown as average values for each group. Given notice, Groups 1-3 show numerical values approximating the standard by the fourth trial. Also, Groups 1 and 2, which were given further instruction at the fifth trial show the tendency to differ from the standard. Although only one example, this finding is very interesting. It is very important to investigate the changes in childrens'letters. Results like this can be very useful for improving educational methods. In addition, it will be effective even for a graphologist to conclude whether the results show the individuals' personal character, or if the letters were changed intentionally. Perhaps the research described may not be useful to the reader; however, it is significant to examine common themes of handwriting research, provided that the uniqueness of each country is considered. I can only hope that advancements in handwriting research will progress on a more worldly scale. I have described peculiarities in many pages, and I intend to outline the results of later research if given the opportunity.